International Flooring Center, Inc. / www.flooringsupplyshop.com warranties all parts and accessories for thirty (30) days from the shipping date (the "International Flooring Center, Inc. Warranty"). Defective parts must be returned within 30 days of the shipping date for refund or exchange. After 30 days, the part may carry a warranty from the manufacturer. Please contact the manufacturer directly for parts found to be defective after the expiration of the International Flooring Center, Inc. / www.flooringsupplyshop.com Warranty. International Flooring Center, Inc. / www.flooringsupplyshop.com fills most orders within the same day as order placement. Once an order is accepted, there is no guarantee an order may be canceled. Any order that is not able to be canceled must be accepted upon delivery and authorized for return following the policy listed below. Please also refer to sections titled "REFUSED SHIPMENT POLICY" and "Unauthorized Returns." Reason for Return? I am sure you do have, you don’t have to tell us. Returns must be authorized by contacting International Flooring Center, Inc. to obtain a Return Authorization Number. Authorization does not guarantee credit. International Flooring Center, Inc. / www.flooringsupplyshop.com will issue credit to the customer upon receipt of the return package. The customer's card may be recharged any applicable fees if subsequent inspection reveals damage, missing components, or incorrect reason for return. Authorized returns must be received by the warehouse no later than 30 days from the date of original shipment to the customer. Packages received after the 30 days from the original shipment date may not be accepted and may subsequently be returned to the customer. All returned products must be in resalable condition, including: all components, manuals, registration cards, and original undamaged packaging. In addition all returned will incur a restocking fee of 25%, all sale are final for Sealers and Cleaners and any liquid products, the will be no return, or exchange. 1) Obtain a Return Authorization (RA) Number: All returns must have an RA number for processing. Call International Flooring Center, Inc. / www.flooringsupplyshop.com at 1-323-731-8453 or by Email: contact@flooringsupplyshop.com to receive a Return Merchandise Authorization number. RA's are only valid for fourteen (30) days from the date of original product shipment to the customer. Credit will appear on the customer's statement within one to two billing cycles. Credit will be issued for part cost, tax, and shipping less any re-stocking fees (where applicable). Shipping may not be refunded in all cases. Incorrect Delivery is defined as any incident where the driver delivers the package to the wrong address or individual. Lost Packages may occur in two ways. First, lost packages may occur when packages are not able to be located within the carrier's network. 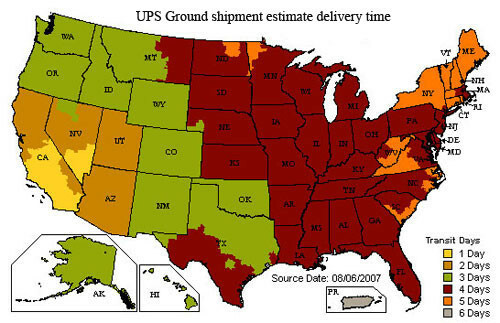 Second, a package may be considered lost when the carrier claims delivery was completed by leaving the package on the doorstep, but the customer cannot locate the package. Both incorrect delivery and lost package incidents are usually discovered through standard tracking of the package. We use UPS, BAX Global and or other private trucking companies for shipping, all standard sizes ship same day. As a customer you must inspect the shower pan before signing for the delivery, no claim will be accepted after signing, as we paying most of the shipping, we can’t effort losing money on shipping for replacement. If damage is discovering please contact us immediately and we will have the trucking company pick it up for no charge while you get replacement shipped same day. The shower pans are light and easy to remove from the box and inspect. We do extra protection for packaging to protect the shower pans very well. Verify you billing address, billing address must be match, the will be no shipping for order that the billing address is not match. In addition the will be 1% for any order that address was update after we been charged for “NO MATCH” by the credit card processing center, and was shipped. Prices are subject to change without notice and limited to stock on hand. USPS - for some state like Hawaii, Alaska, Porto Rico, Virgin Island and some specific zone that USPS delivering better delivery time we will use the Post Office, Canada and International we mostly use USPS. We will use FedEx and or UPS base on the time order arrive and base on UPS / FedEx pick time, with both companies we will provide tracking that you can track your order from “ My Account" on our web site.